The last few weeks have been quite the blur. The last couple of weeks of school were packed with activities for the children, we visited family for a week a few days after school let out and VBS filled our week last week. Today is the first day I have had to breathe and I have been inspired to write. We all know that every church worships a little differently. Some sing old hymns straight from the hymnals, others sing songs with the lyrics posted on large screens or on pre-printed bulletins, some have grand organs. some have a few people playing instruments and some have large worship bands that are almost concert-like. Throughout my years, I have experienced all of these kinds of worship scenarios, but one recently rocked my world. As I mentioned, last week, we visited family in a small town in Alabama. There is a ministry there that my family attends and they invited our oldest son to sing during their Kids Ramp. Kids Ramp is a three-day conference for kids ages 6-12. It follows the same format that their gatherings do for teens and adults. They did not water down this conference for these wee little ones. I had never attended a Kids Ramp before so I had absolutely no idea what to expect. This ministry, The Ramp (theramp.org), was built around worship. God led a woman by the name of Karen Wheaton to lead this ministry. God had prepared her for this by blessing her with an incredible voice and presence on the stage. She has traveled the world blessing people with her music. The Kids Ramp conference met on Thursday evening, Friday morning, Friday evening and Saturday morning. And each time we met, we opened in worship. Their worship leader, Catherine Mullins, came out swinging. I now know why she is so skinny and I am not sure how she dances around like that and still sounds so great. In contrast to what I am used to in children's ministry, she led worship as if she was leading a group of adults in worship. She was teaching these little children how to worship the Lord with all they had. For an hour....yes, that's right....a full hour of worship Every. Single. Time. We. Met....and the kids LOVED it! It was on that second night of worship somewhere between ten and fifteen minutes into worship that I was led to a place I had never visited before. It is almost hard to describe in words. Even as I watch this video, I can't make out the same feeling. That night, as I stood there worshipping, I felt as though I had been ushered into the presence of Heaven. I could feel the angels worshipping with me and I heard sounds I had never heard before during worship. Yes, the music was loud in there and the feeling was electric, but the noises were not coming from natural instruments. It was as though thousands of angels were singing and worshipping the Lord in their own voices without words. It was so dizzying, but I didn't want it to end. And on top of all that, every time I closed my eyes to worship, I saw the face of what appeard to be a majestic lion staring at me. It wasn't the mangy, devouring lion we are warned about in 1 Peter 5:8. No, it was the majestic lion, the Lion of Judah, that sits on the throne in Heaven that is described in Revelation 5:5, "Look, the Lion of the tribe of Judah, the heir to David's throne, has won the victory." The doors to a whole new world had been opened to me in the middle of that conference I was attending as a parent/chaperone. The event wasn't for me or about me, but because I was willing to open my heart with abandon, I experienced something totally beautiful and life-changing. The conference ended and we came home and went about our business. We survived VBS (remember, I wrote about our VBS this time last year....it's no vacation - check out the archives for that one) this week. So by yesterday afternoon, I needed a few minutes to unwind and relax. 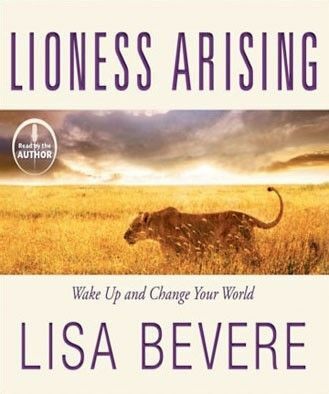 As I sat there in my quiet, I picked up a book I purchased over a month ago for some summer reading, Lioness Arising by Lisa Bevere. And guess what Chapter One was titled? Awaken a Lioness! That's right...SO not kidding. In that chapter, Lisa describes this vivid dream she had and all about her encounter with a lioness. Seriously??? Had I read that chapter before attending the Kids Ramp, it may have not hit me so hard. But I know that lion! I saw that same lion! And on page twelve, something began to stir inside of me. I read these words, "Lionesses hunt together....Could it be God wants to awaken something fierce and wild within His women?" Yes, that is how God gets our attention. In the middle of something when we least expect it, He can grab our attention. In the middle of a worship service that was for kids, He stirred something within me. Only Him! Catherine's worship style inspired me too. As she says during the video clip above, "You are never too young to worship the Lord. It is a present for Him. He loves our worship." King David modeled this well for us. 2 Samuel 6:14 says, "And David danced before the Lord with all his might." Why shouldn't I? This morning, I got to escape upstairs to exercise. I use this as my time to worship the Lord through music. I plug my earbuds in and escape. Today, I had a few of the songs on that were played at Kids Ramp. As I started out, it was all about me. My worship to the Lord. I sang, I danced...and I was completely out of breath! As I worshipped, my heart began to cry out in prayer for a young man we heard about last night at dinner. A couple we know has a son that is struggling with some major stuff. As I sang and worshipped, instead of it being my name in those songs, I cried out for this boy, for his deliverance, for his freedom, for his shackles to be removed. I danced wildly on that treadmill and for the first time ever on that thing, I broke out into an all out sweat. You may think I am slightly crazy, I know my kids do, but in that moment, I felt the angels move. I felt a release for that boy and perhaps somewhere, he danced wildly and didn't even know why. Hallelujah! These are the unexpected moments of being a Jesus follower. Once you release your own self to Him, He can move through you and in you when you least expect it and do things you never thought before. He can use all of us regardless of age...young and old...we just need to be willing to respond. Is there something stirring within you? If so, don't hold it back!